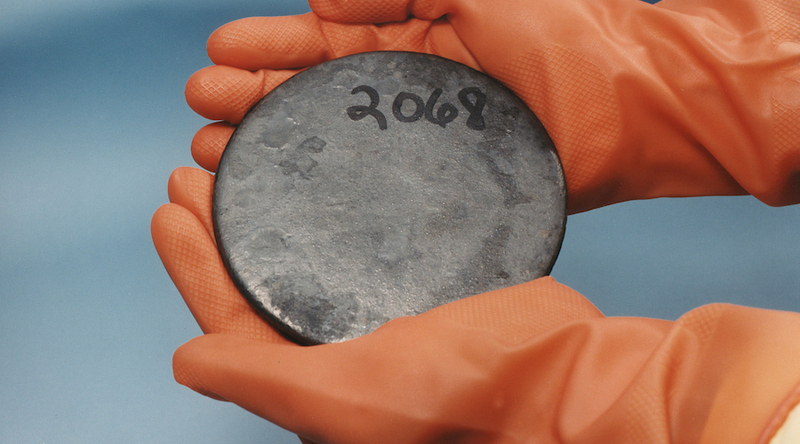 A billet of highly enriched uranium. (Photo from Wikimedia Commons). India’s very first uranium mine, the Jaduguda mine located in the state of Jharkhand, now hosts a laboratory for conducting experiments in fundamental physics. The Jaduguda Underground Science Laboratory 550, built in a 37-square-meter cavern buried 905 metres and formerly used for storage, will focus on the search for dark matter. It was built by the Saha Institute of Nuclear Physics and it is expected to gather the country’s brightest experimental scientists interested in cutting-edge research. Repurposing the cave in the 50-year-old mine managed by the Uranium Corporation of India required an initial investment of $32,000. Scientists considered this to be the best place to install a low-temperature cesium iodide detector because its depth would shield the device from other particles. The site’s uranium deposits, which produce 25 per cent of the raw materials needed to fuel India’s nuclear reactors, are located some 300 metres away from the lab. Thus, physicists working there are not concerned about background radiation.